Nord's Painting Saga: A Visit to Valhalla! I have been to Valhalla! It was not full of viking warriors drinking ale, fighting and carousing, but a few tourists drinking beer and chatting. Maybe I got the wrong one - this pub in York is the one I visited. Wooden benches, fur blankets, flickering (medieval) lamps, runes carved into timbers, there was even mead served in horns. It was definitely characterful bordering on cheesey/comical, but it served nice beer and there were plenty of beards to check out. 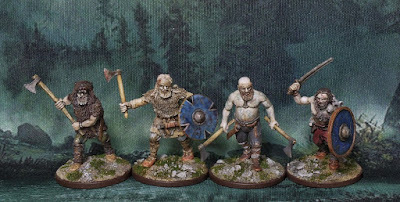 It did inspire me to dig out some of my vikings that I had started to paint back in the spring. Just a pair of them to finish off a small unit of bereserkers. 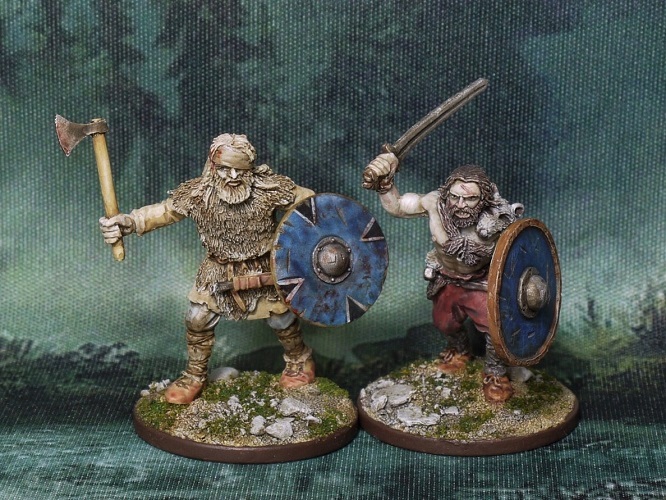 These are V&V miniatures, which I have said before are probably the finest sculpts available to budding jarls, as long as you don't mind working with resin and paying a little extra than usual. One of the two figures does look a little too old to be a berserker. I did reinforce the age vibe with his silvery beard and tattered clothing. With that bandage round his head he has the appearance of a walking wounded, so there's a good chance he will be demoted to a bondi at some stage in the future, though the blood spatters on his axe and shield suggest he should not be underestimated. And here's the unit of four berserkers ready to wreak havoc on their weakling opponents. More vikings to come in the next few months I think. There's the long-awaited (by me at least) Saga battle book just been announced, so I am keen to get some more of the Northmen painted and ready for action. For the glory of Odin! Excellent! Really great looking vikings!